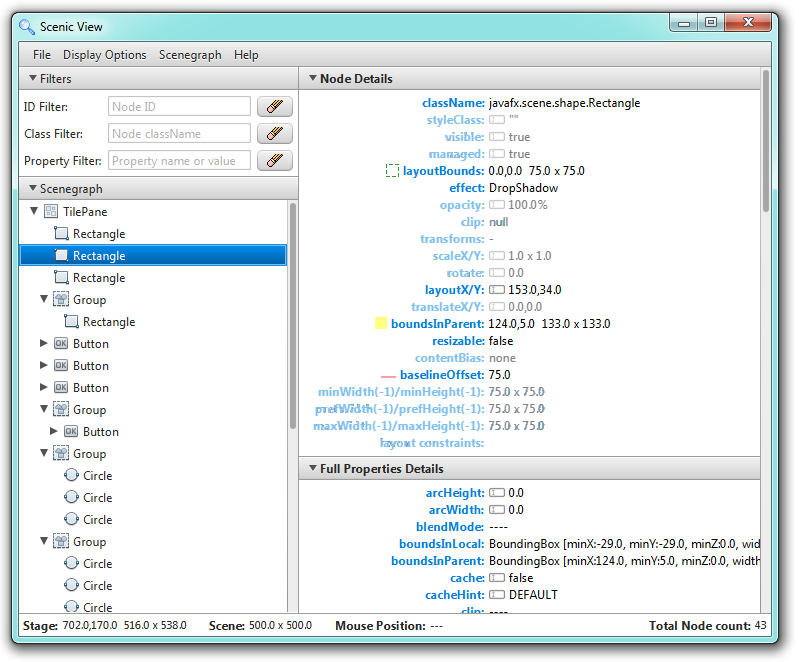 Picking the version number for this release was a little difficult – Scenic View has existed for a very long time, but until now has not had a version number assigned to its releases (the last of which was the first public release). Therefore, Ander Ruiz and I decided to make this next release version 1.0, and to start numbering versions from there. We have a lot planned for future releases, so keep an eye out on the Scenic View page here at FX Experience, and follow FX Experience on Twitter if you want up to the minute news. Also, you may be interested in the interview I did with Ander last week. Finally, on behalf of Ander and I, enjoy this application! Please provide feedback in the comments section and we may add the feature or bug fix in a future release. Nice selection of features quickly added since the first public release. Can you add anything to ScenicView which helps debug the event chains (e.g. filtered logs that events are fired, filtered or consumed)? I’ll add it to the todo list. We do have a new feature coming up in 1.1 that includes a scenegraph tracer – it shows every Node added and removed from the scenegraph. I’ll see if we can do something similar for events.